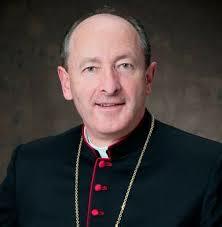 Bishop Cullinan was born in Lahinch, County Clare in 1959 to Christy and Rita and has four sisters and five brothers. 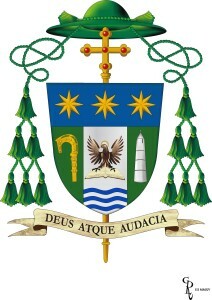 Bishop Cullinan is a priest of the diocese of Limerick. His family moved to Limerick city where he attended the Salesians for early education, John F Kennedy National School and the Crescent College Comprehensive (SJ) for his secondary education. From 1978-1981 he attended Mary Immaculate College of Education Limerick and qualified as a primary teacher (B.Ed) in 1981, and taught for six years in Castleconnell, County Limerick. He worked part-time during that time for four years with the Bunratty Castle Entertainers before going to Spain where he taught English for two years in a school in Valladolid. 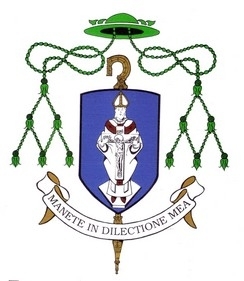 Bishop Cullinan studied at Saint Patrick’s College Maynooth from 1989-1995 where he completed an STL (Licentiate in Theology). He was ordained by Bishop Jeremiah Newman in 1994 in Saint John’s Cathedral, Limerick, and appointed Curate in Saint Munchin’s Parish Limerick city 1995-1996. 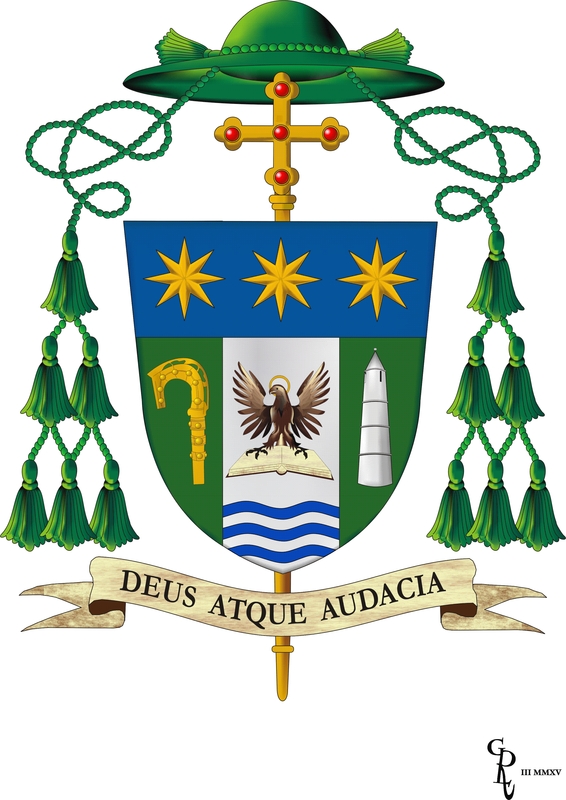 Bishop Cullinan’s next appointment was as chaplain to the Regional Hospital in Limerick from 1996 until 2001. He studied for his doctorate in moral theology in the Alfonsianum in Rome 2001-2004 and was appointed chaplain to the Limerick Institute of Technology 2004-2011. He was appointed Parish Priest of Rathkeale , County Limerick in 2011. He was ordained Bishop of Waterford & Lismore on Sunday 12th April 2015. On the right side of the shield we find represented the ancient crozier of Lismore (circa AD 1100), Lismore monastery was founded in 635 by St. Mochuda. Its site is now occupied by Lismore Castle. In the centre an eagle resting on the Book of the Gospel, symbol of St. John the Evangelist to whom the Cathedral of Limerick, the diocese where Bishop Cullinan comes from, is dedicated. On the left side of the shield, upon a green (vert) field is the round tower of Ardmore. On the blue (azure) chief of the shield, we see three golden stars which represent the Holy Trinity to whom is dedicated the Cathedral of Waterford and Lismore. Bishop Lee retired as Bishop of Waterford & Lismore on October 1st 2013. William Lee was born in Newport, Co. Tipperary, on December 2, 1941. He received his early education at the Convent of Mercy National school, the Boy’s National school, Newport and later at Rockwell College, Cashel. 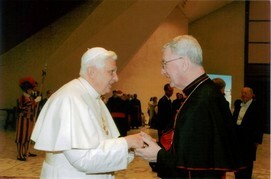 He studied for the priesthood at St. Patrick’s College, Maynooth and was ordained in 1966. 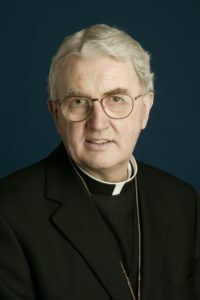 After ordination he studied Canon Law at St. Patrick’s College, Maynooth, and was awarded a Doctorate in Canon Law in 1969. Later in 1969 he was appointed curate in the parish of Finglas West in the archdiocese of Dublin where he ministered for two years. On his return from Dublin, he studied Canon Law for a short period at the Gregorian University, Rome. He was then appointed Bursar and Professor of Philosophy at St. Patrick’s College, Thurles. While there he served on the Cork Regional Marriage Tribunal, was Chairperson of the Diocesan Catholic Marriage Advisory Council and was a member of the first National Executive of the Catholic Marriage Advisory Council in Ireland. He was appointed President of St. Patrick’s College, Thurles in 1987. He was ordained Bishop of Waterford and Lismore on 25th July 1993. Bishop Lee has served on the Commission for Clergy, Seminaries and Vocations and the Commission for the Laity of the Episcopal Conference and was also President of Accord.